Driving lessons in Guildford - Guaranteed satisfaction! Learn to drive quickly and easily with our driving lessons in Guildford. Scroll down to find out how 1st 4 Driving offers the best driving lessons in Surrey and the surrounding area. 55% of learners fail the driving test. Book lessons today to find out why 98% pass with us! Learning to drive doesn’t have to be stressful. 1st 4 Driving combines enjoyable lesson plans with the most up-to-date training methods backed by the DVSA. Our high first-time pass rate is proof that we are experts in driving tuition. Book your driving lessons with us, and you will be in safe hands. Save money on expensive textbooks when booking lessons with us. All our pupils are entitled to full theory training with Theory Test Pro. Save even more money and pass first time. Our high first-time pass rate is one of the best in Guildford. Every pupil will receive the free guide ‘How to Pass the Driving Test First Time’ by Driving School Dave. All our instructors use the latest coaching methods to help you pass your driving test in Guildford. Our driving instructors will never ‘shout’ and will always be on time and ready to teach. We’ve all got busy lives, but you won’t miss a lesson with our text reminders. A driving school you can trust. Our driving instructors in Guildford have all been Disclosure and Barring Service (DBS) (formerly CRB) checked. You’re in safe hands with us. The highest qualified driving school owner in the country! 1st 4 Driving is run by Dave Foster MA, Dip.DI, AKA Driving School Dave. The most qualified driving school owner in the country! 1st 4 Driving was founded by Driving School Dave in 2000, and since then he has gained almost every relevant qualification there is, from cars to motorbikes to fleet training. Dave is at the forefront of the way the school is run, and this includes driving instructor training. This means that our instructors are in the best position to pass these skills and knowledge on to you, to make you the best driver you can be. With 1st 4 Driving, have access to one of the highest-qualified support networks in the country. From our Advice page to our friendly office staff, we are in the right best position to help you learn in Surrey. Book now with no risk. We’ll give you your money back in the unlikely event you are unsatisfied with your driving lessons. Of course, we will always try to resolve the problem or re-allocate you to another instructor. If you ever have any issues with learning to help, you’re only a phone call or a message away from an expert member of staff who will be more than willing to help you. 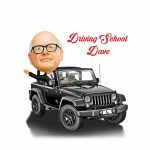 Like our instructors, our staff have knowledge that has trickled down from Driving School Dave, the most qualified driving school owner in the country. Read more about our guarantee here. Our driving lessons are designed to help you learn, but also to have fun. Remember, these are YOUR driving lessons – and the things you will learn in your lessons will stay with you for life. That’s why it’s doubly important that you do your research before choosing a driving school. A quick Google search will show you that there is a lot of choice for driving schools in Guildford, but we’re hoping you can see that we’re the best. Our specialist two-hour lessons will ensure that you get the most out of your driving lessons in Guildford. This is a proven method to help you pass your driving test quicker. 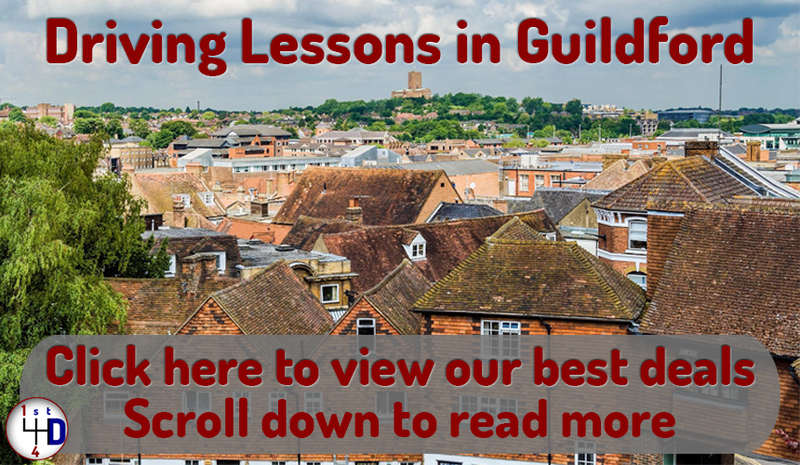 Guildford is a great area to learn to drive. You’re never far away from main roads like the busy A3, or smaller roads in the town centre. With your instructor, these roads will help you practice junctions, roundabouts and parking, meaning you’ll be test-ready in no time! Studying in Guildford? No problem. Just ask our office team and you can be picked up straight from the University of Surrey, or any school or college. And when you’re feeling more confident, your instructor will encourage you to drive home in the car! Still unsure? 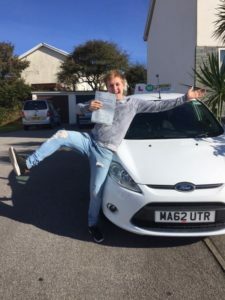 Check out our reviews page to read the testimonials of people who were, like you, looking for driving lessons in Guildford and now have the driving independence they always wanted. So we’re the most trustworthy, most qualified, most friendly and reliable driving school in Guildford. 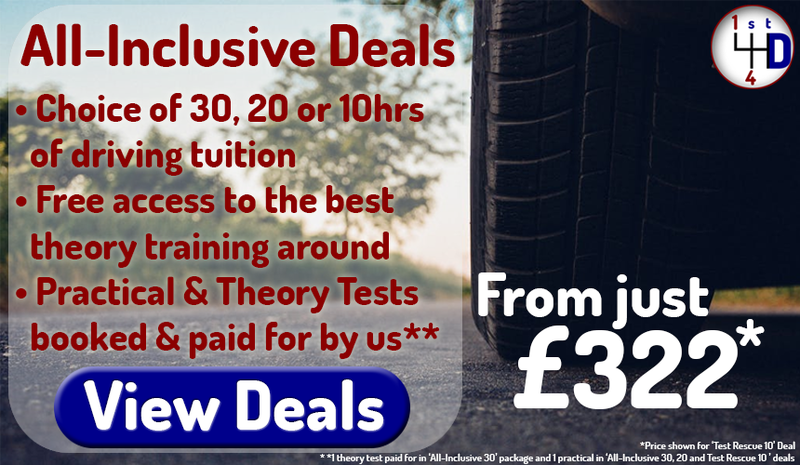 Our prices are great, we offer discounts for block bookings, we give you FREE, FULL theory training, and we are willing to guarantee that you’ll love your lessons. So, take a leap. Book your driving lessons today and we can get you assigned to an instructor to start learning ASAP.